Two moments prominently featured in the Instant Family trailer attempt to wring laughs from the image of an anxious foster kid getting violently smacked in the face with a ball. They speak to the worst impulses of writer-director Sean Anders, whose tendency to go for broad slapstick and cheap gags has carried across films like the Daddy’s Home series and Horrible Bosses 2. Yet a scene in which that same kid is hurt and the film takes his injury incredibly seriously speaks to the best impulses of Instant Family. Loosely inspired by the experience that Anders and his wife had when they decided to foster and eventually adopt three older kids, Instant Family balances its sitcom tone with some real, unexpected heart. It’s an old-fashioned “message movie,” one that wants its audience to leave with a better understanding of the foster care system and the firm belief that no foster kid is beyond help, no matter their age or life experiences. 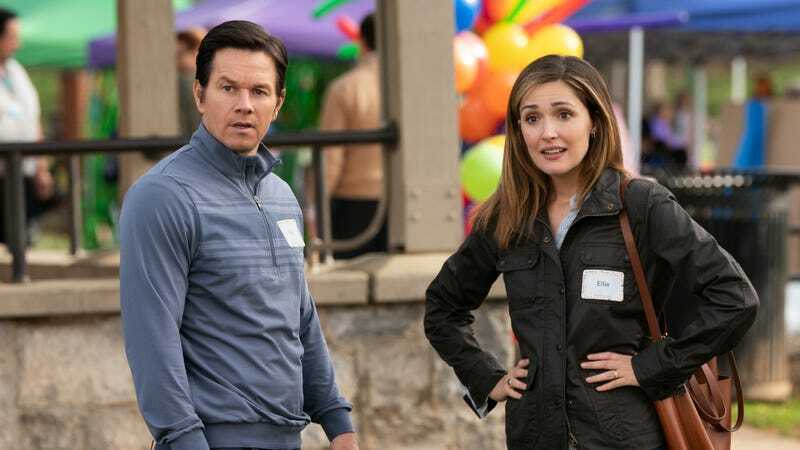 Anders’ adoption journey is reimagined as the story of Pete (Mark Wahlberg) and Ellie (Rose Byrne), two successful house flippers who suddenly realize they’ve left the question of whether or not to have kids until a little late in life. Pete offhandedly jokes that if they adopt a 5-year-old it’ll be like they got a head start on the whole parenting thing. Soon Ellie is researching the adoption process, and the impossibly adorable faces of kids in need of a home leads them to take a crash course on fostering that culminates in a big “foster fair”—a sort of speed-dating event for potential foster families where the little kids get all the attention and the teenagers are treated like pariahs. Pete and Ellie are unexpectedly won over by the sarcastic attitude of 15-year-old Lizzy (Isabela Moner), who’s moving through the system with her anxious younger brother, Juan (Gustavo Quiroz), and their temperamental 5-year-old sister, Lita (Julianna Gamiz). Adopting three kids at once, let alone a rebellious teenager, is more than Pete and Ellie initially bargained for, but surely their skills at flipping houses make them well suited for rehabbing some troubled kids, right? If that metaphor makes you uneasy, don’t worry, the film is way ahead of you and willing to call out its characters each time they put a foot in their mouth. Early on, Pete himself raises the question of whether he and Ellie are becoming “white saviors,” which is at least a brief acknowledgment of the racial dynamics at play (their foster kids are Latinx), even if that likely won’t completely satisfy all concerns about that issue. To provide even more balance, the film also includes a bunch of other foster families as recurring supporting characters to ensure that Pete and Ellie’s story isn’t the only one being told. Although Instant Family keeps things relatively light in its main storyline, it acknowledges the harshest realities facing many kids who end up in the system—from physical and sexual abuse to struggles with addiction. Instant Family makes adoption look worthwhile, but never sugarcoats how difficult it is either. As has been the recent trend in comedies like Neighbors and Game Night, Pete and Ellie are presented as comedic equals in their foibles (a step up from Linda Cardellini’s thankless role in the Daddy’s Home series). At one point, they only half-jokingly concoct a plan to send the kids back into the system and come up with a lie that makes them look like the real victims. The hit-to-miss ratio of the jokes is skewed in the wrong direction, but the film at least offers a wide range of comedic tones as it aims for “telling it like it is” truths about the challenges of parenting. Octavia Spencer and Tig Notaro make a delightfully deadpan comedic duo as the two social workers guiding Pete and Ellie through the adoption process. Meanwhile, Margo Martindale all but steals the movie as Pete’s brassy mom, who sees in her new grandchildren much of Pete’s own youthful rebellious streak. Most modern studio comedies feel obliged to shoehorn a self-actualization message into their third act. Here, it’s the meat, not the digestif. Playing the most emotionally rich character in the film, Moner beautifully coveys the way Lizzy is both a young woman who carries the weight of the world on her shoulders and a teenager who can’t always see the bigger picture. She’s the only one of her siblings old enough to remember actually living with their mother, and Lizzy’s therefore the one most desperate to get back to her once Mom’s been released from a stint in prison. The film takes seriously the idea that reunification is often the primary goal of the foster care system, and Pete and Ellie wind up proving themselves as parents not just in how well they provide for their foster kids but in how empathetically they put their kids’ emotions first. By the time it’s traded in intermittent laughs for tearjerking sequences, Instant Family has become a hybrid movie worthy of its blended family.